Captivate is North America’s leading location-based digital video network reaching millions of professionals throughout the day. We connect viewers to the world outside their office by delivering valuable information and entertainment. Utilizing multiple touchpoints including elevator screens, mobile & desktop to influence personal and professional purchase decisions, we maintain a 90% engagement rate among a quality, hard-to-reach audience of 12 million unique viewers every month. This Business Development Manager will work out of Calgary or Vancouver (home office) and will be responsible for developing new business through client direct advertising sales within the new business development unit. They will be working on a list of currently identified prospects in Alberta, while continuing to grow and qualify it, for new revenue generation on the network. The prospect categories include technology, energy (oil & gas), financial services, travel, education, professional services, as well as other relevant advertisers and categories. The ideal candidate will be self-motivated, strategic, have a passion for sales, and bring a consultative selling approach for creating solutions that help our clients meet their advertising needs. Captivate’s environment is very collaborative and team focused, while promoting autonomy for success. Responsibility for meeting and exceeding revenue targets is the objective and compensation is salary plus commission. At least 3+ years of selling/business development experience in media, digital advertising, marketing or technology and a track record of achievement. Sales experience in other areas also considered. Established personal and client relationships within prospect categories at the marketing level is a big plus to help navigate and leverage ways into companies. Ability to educate client marketing groups through a strong understanding of their business and industry challenges to intelligently recommend advertising solutions. An understanding of both B2C and B2B sales and marketing would be an asset. Proven ability to find and establish relationships with decision makers. Captivate encourages work-life balance through team building activities, employee outings and celebratory events. 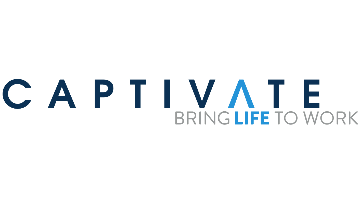 Captivate is a growing, dynamic company with a great work environment that provides the opportunity to make an impact. Behind the screens of Captivate are real people. Check out our Employee Spotlight page!